Client had monolithic applications running on Virtual Machine on public cloud. They wished to reduce the time to market duration of their product, by making the development and deployment process quick. Client was also interested to have automated, highly available and easy maintainable setup. OpenShift Container Platform was the best chosen option due to ease of accelerating the development and deployment process. 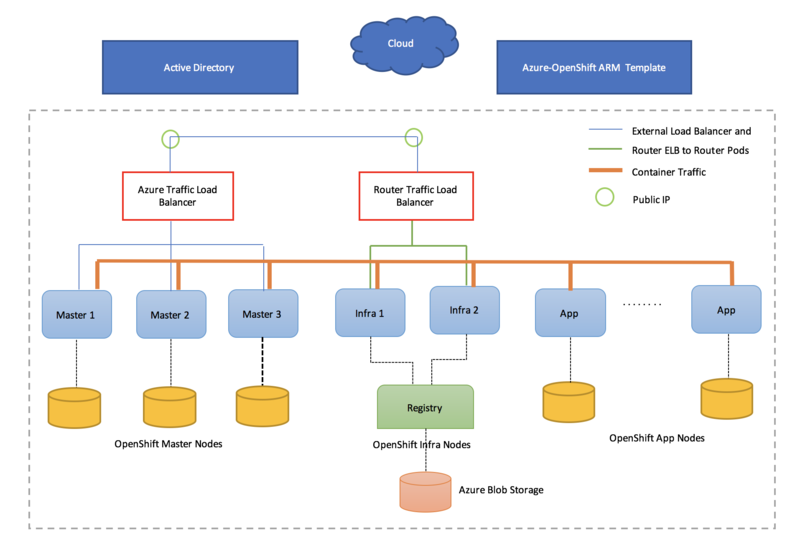 OpenShift offloaded the authentication process completely to Azure AD. The OpenShift Container Platform master component such as etcd, API server, Web console and controller manager server were hosted by mater nodes. Infrastructure node instances were just like regular OCP nodes but with a different label so that they were used to host components like OpenShift Container Platform router and OpenShift Container Platform integrated registry. Azure Blob storage was used by Infra nodes so that multiple pods can access the registry at the same time. Registry was scaled to 2 pods to achieve high availability and load balancing. OpenShift Container Platform metrics were utilised for configuring auto scaling of pods based on the threshold. The application nodes were used to deploy containers by the users. Azure specific storage such as Azure VHD was be assigned to containers using persistent volume claims. Router load balancer came into play when application was accessed from outside the cluster. Step 2: Installing OpenShift Container Platform on Azure. Step 1: Provisioning of the environment was done using ARM templates provided in  openshift-ansible-contrib git repository. Step 2: Installation of OpenShift was done using the Ansible playbooks. In this step inventory was created and parameters were set to create the cluster. It also deployed registry and router by end of this step. Step 3: Verification of the cluster set up and Single sign-on configuration using Azure Active directory was done in this phase. By implementing this architecture client could accelerate their development and deployment process. Containerisation of the application helped them follow agile methodology and so helped them do continuous integration and deployment. As Ansible is used for deploying OpenShift the complete process was automated, which reduced the operational overhead. OpenShift’s developer and operations centric tools helped them achieve scaling on need and long-term life-cycle management.